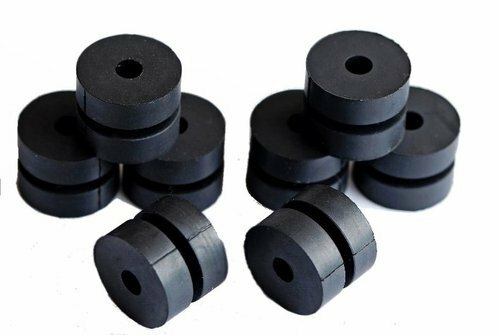 We bring forth our clients a wide range of Precision Rubber Parts that is utilized in several industries and other applications. These products are stringently checked by our quality inspectors before the final dispatch. These components are manufactured in compliance with international quality standards using high grade rubber. Molded auto parts are popular in international markets for their easy installation & operation and long service life. We are committed towards providing innovative solutions in Rubber And Polyeurothane Products like Natural, Nitrile, Neoprene, Epdm, Silicon Rubber, Rubber Joints, Rubber Mounting Pads, Rubber Pads, Rubber Pipe Support Sings, Rubber Rods, Rubber Sheets, Rubber Strips, Rubber Track Pad, Silicon Rubber, Silicon Rubber Fittings,Silicon Rubber Products, Automotive Rubber Components, Epdm Rubber, Fluorosilicon Rubber, Molded Rubber, Molded Rubber Parts, Natural Rubber, Nitrile Rubber, Rubber Balloons, Rubber Bellow, Rubber Buffer, Rubber Bushings, Rubber Coupling, Rubber Diaphragm, Rubber Expansion Joints, Rubber Fender, Rubber Mountings, Rubber Parts, Rubber Products, Rubber Rollers, Rubber Sleeves, Rubber Suction Cups, Rubber Washers, Polyurethane Casting and Solid Rubber Tyre which are at par with the international standards as well as meet the various specifications and needs of the industries in terms of functionality and durability standards. Our products go through rigorous quality checks periodically to maintain quality consistently. Our efficient team of experts keep a strict vigil on every aspect of manufacturing of these products until their final dispatch. Our teams also offer a comprehensive guideline to our client and thereby help them choose the right kind of products. Alternately, we also take clients' specification and deliver the products according to their needs and demands. Periodic quality checks are also done by our team to guarantee an authentic and efficient delivery of our products.